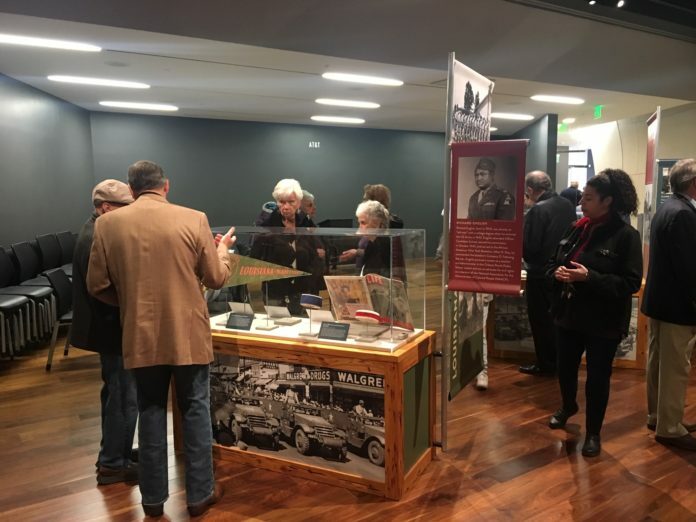 The unveiling of a new exhibit, “The Pelican State Goes to War: Lousiana in World War II,” was unveiled Friday, Feb. 1 at the Louisiana Sports Hall of Fame and Northwest Louisiana History Museum. Produced by the National WWII Museum in New Orleans, the exhibit showcases extraordinary artifacts that highlight our state’s contributions to America’s war efforts during WWII. Artifact range from uniforms, photographs, letters, medals and much more. During a reception Feb. 1, several intriqued guests came to see the many war time artifacts. The program began with the NCHS JROTC performing outside the museum, then the NSU Color Guard presented colors in the exhibit area while the National WWII Museum’s Victory Belles beautifully performed the National Anthem. Admission to the museum is $5 for adults, $4 for students, seniors and active military, and free for children 6 and under. More information about the museum can be found on www.louisianastatemuseum.org. The Victory Belles performed at the exhibit’s reception. They are Jessica Mixon, Haley Taylor and Mandi Mueller. Members of the Natchitoches Central High School JROTC performed outside the museum before guests went inside to see the exhibiton.